1 of 1 Heat oven to 350 degrees . Slice tops off of garlic bulbs and drizzle each with 1/2 teaspoon olive oil. Wrap in foil and bake at 350 degrees for 1 hour. 1 of 1 In a medium-size bowl, combine butter, Parmesan, crushed garlic, Italian seasoning, parsley and red pepper flakes. Refrigerate. 1 of 3 In a medium-size saute pan over medium heat combine oil and garlic. Cook until lightly browned, about 2 minutes. Add tomatoes and heat through. Stir in basil, salt and pepper and remove from heat. 2 of 3 Remove roasted garlic from oven, unwrap foil and cool. Once cooled, squeeze cloves from papery skin. Set aside. 3 of 3 Spread 1/2 cup garlic butter over bread (reserve remaining 1/2 cup for another use). Bake at 350 degrees for 20 minutes, until browned. 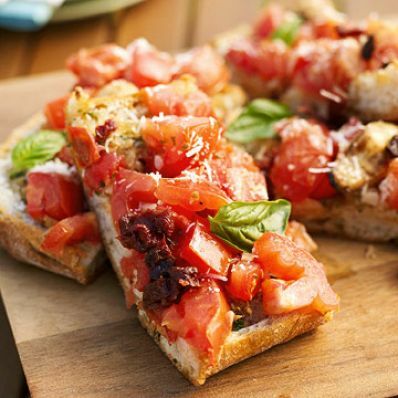 Top with tomato salsa, roasted garlic, sun-dried tomatoes and Parmesan cheese. Slice into pieces and serve.